List of plants that are grown for food. Dragon fruit grow on a vine-like cactus. They are native to Mexico, Central America, and South America but are grown in a number of Asian countries and even Australia. Their flowers open at night and have a nice smell. The pulpy center of the fruit is eaten raw, and the juice can be drank or used to make wine. 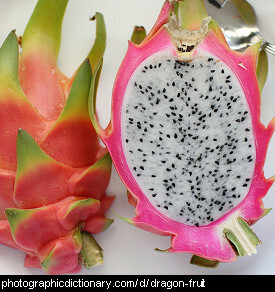 Dragon fruit has a very mild taste.